While I was researching this weekend's blog post, I came across an interesting piece of Fortean history... even though it wasn't what I was looking for! 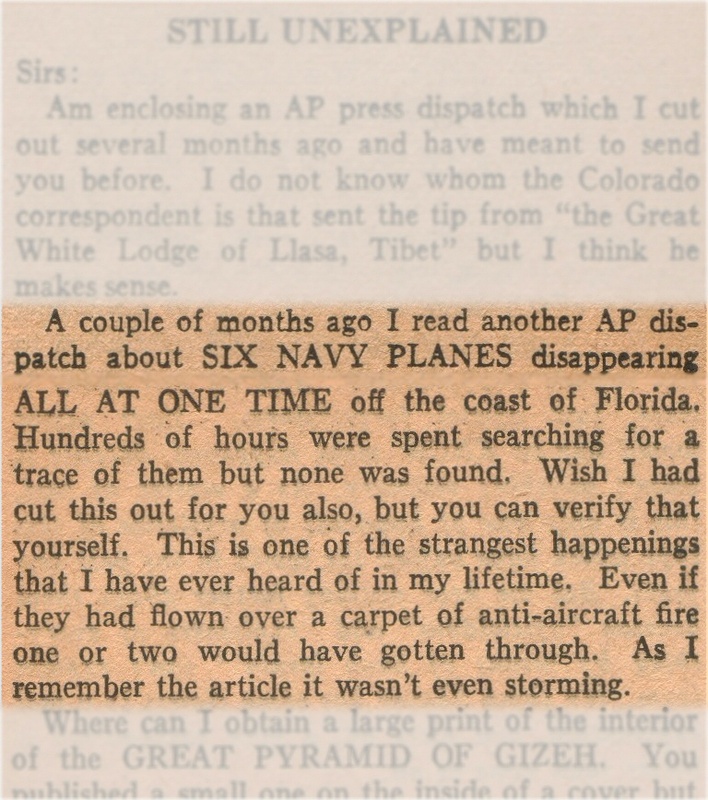 It is, I believe, the earliest speculation in print regarding a potentially paranormal explanation for the disappearance of Flight 19 in December 1945... the incident that would later give rise to the myth of the Bermuda Triangle. The scan on the left comes from a "letter to the editor" (from one Edward R. Walker of Colorado) in the August 1946 issue of Amazing Stories. 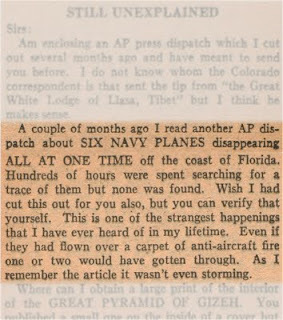 There can be little doubt that 'Six Navy planes disappearing all at once off the coast of Florida' is a slightly garbled reference to the loss of Flight 19 (consisting of five Avenger torpedo bombers) and the subsequent loss of one of the search aircraft (a Martin Mariner flying boat). The letter in itself isn't particularly interesting... after all, the incident must have made headline news only a few months before the letter was written. What is far more significant, historically, is the editor's reply. And part of the significance is just who that editor happened to be! In 1946, Amazing Stories was edited by none other than Ray Palmer... who later became famous as the editor of Fate magazine. It was Fate, under Palmer's editorship, that first popularized the Bermuda Triangle mystery in the early 1950s. 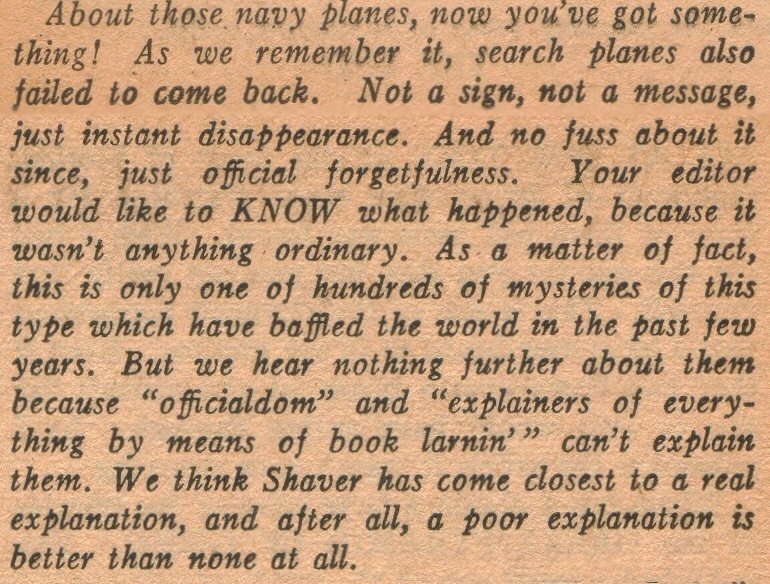 But Fate didn't appear until 1948, when Palmer left Amazing... or more accurately, when he was forced to leave Amazing. The magazine was supposed to be devoted to science fiction, but Ray Palmer, as editor, had consistently alienated his publishers and traditional SF fans by focusing on "non-fiction" mysteries of the Fortean kind. Foremost among these was the Shaver Mystery, which dominated Amazing in the last few years of Palmer's editorship. 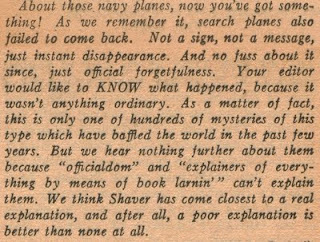 This particular issue (August 1946), for example, contains a short "semi-factual" novel by Richard Shaver himself, as well as a two-page feature on The Shaver Mystery by Palmer. The final comment is interesting, because it suggests that Palmer wasn't completely satisfied with the Shaver paradigm... and was ready to abandon it if something better came along. And in 1948, that's exactly what happened, when Palmer became one of the first to jump on the "Flying Saucer" bandwagon!